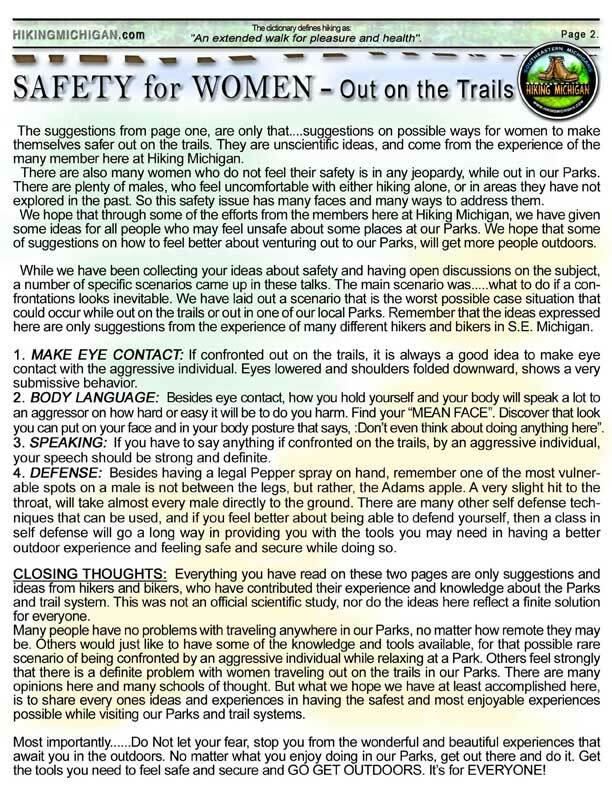 A few years back many of the women Hikers started talking about feeling unsafe out on the Trails. This went for both Hiking and Biking. As a male, it was something I never much considered. So……after a few open Hike discussions, we sat down around a Campfire, and the women put together their thoughts on what they felt made them feel safer out on the Trails. What is good about these WOMEN SAFETY sheets, is that they where put together by women, for women. A women’s insight on feeling safer outdoors. We also exchanged ideas with one another on the simple things that did so much when it came to making anyone more safe out in the local Parks. You can Download the WOMENS SAFETY sheets here. 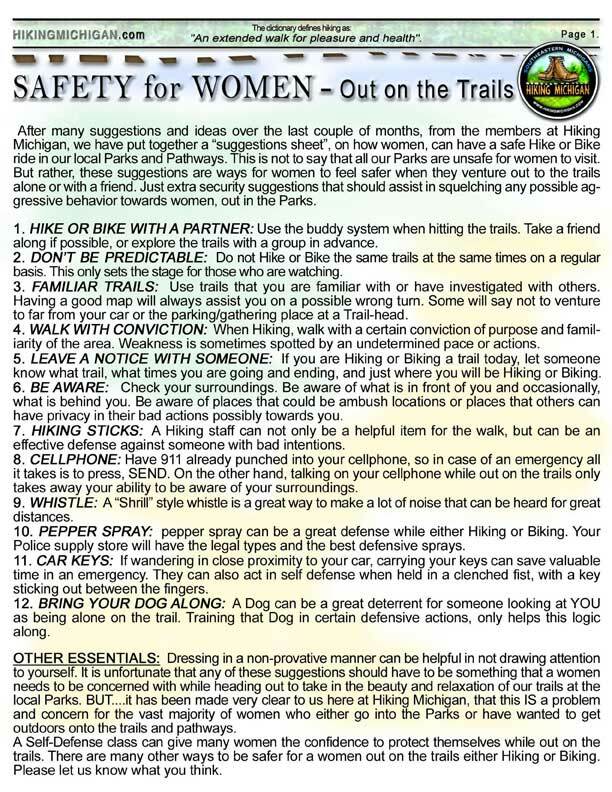 The main intention for these Safety Sheets where for the comfort and safety of Women, out on the Trails. But the shared ideas here work well for EVERYONE out in the Parks, and also help out in a Survival situation. It has been a few years since we all talked of this concern together. 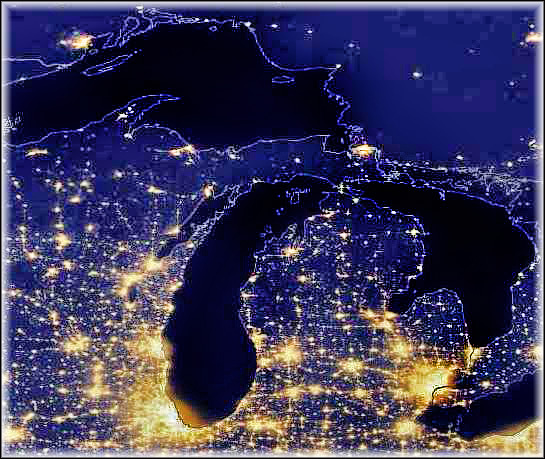 I have come to realize that there is much connected between personal safety and survival, while out in the Forests. 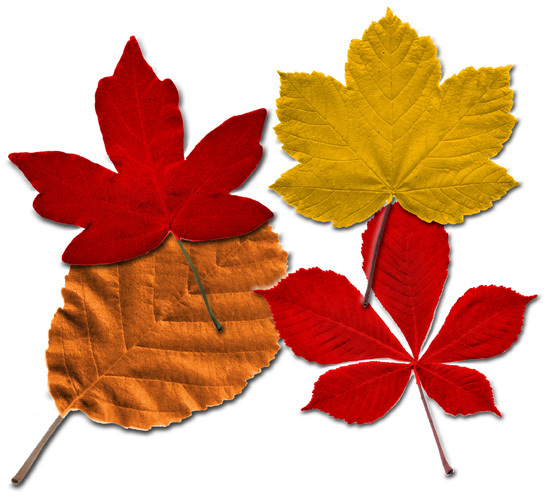 Many of the items we may carry along with us for Survival, do double duty when it comes to personal safety. Here is a picture of what I carry on every Hike I take. The Bag that goes around my shoulder is my Camera bag, and I use it as a base to carry other survival and safety items. There are two different Flashlights. One is small, and also contains a magnifying glass, Compass and high pitched whistle. The other Flashlight is a very bright beam, that doubles as a signal light and is fashioned to be used as a stabbing tool. Also dangling from my Camera bag is a small container of “Pepper Spray”. It was purchased at a local Police supply store. It contains the maximum legal strength of Pepper spray the public can use legally. With all the funny laws out there, the last thing anyone needs is to be sued for protecting ones self by spraying an individual attempting to attack you. Empty this small canister on an Attacker, and he or she, will definately be going to the ground. I also carry some “Pepper Wash” in one of the pockets of my Camera bag. Because I use this Camera Bag as my base for Hiking, it allows me to carry quite a bit easily, over my shoulder with ease. 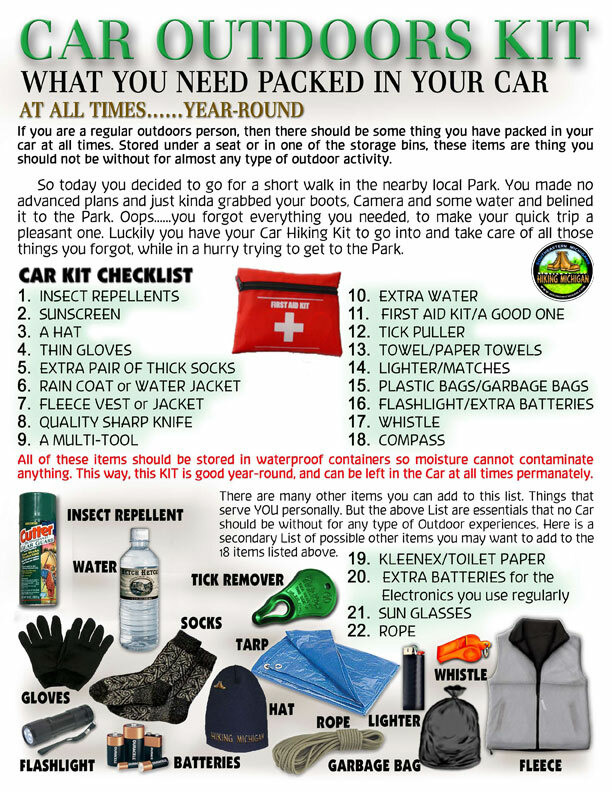 This includes some goodies, and other personal needs like Insect repellent and Water. 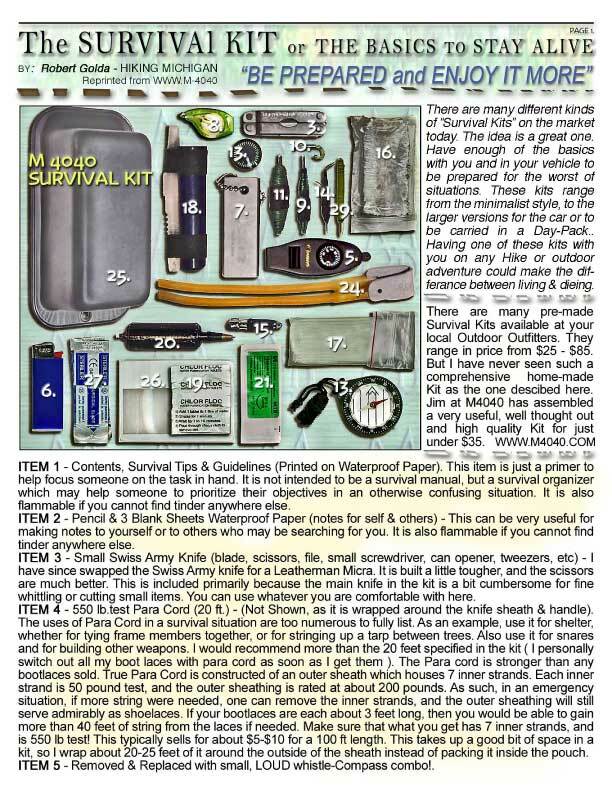 One of the very best SURVIVAL KITS I have ever seen, was put together by a friend-Jim, at M4040 web site. 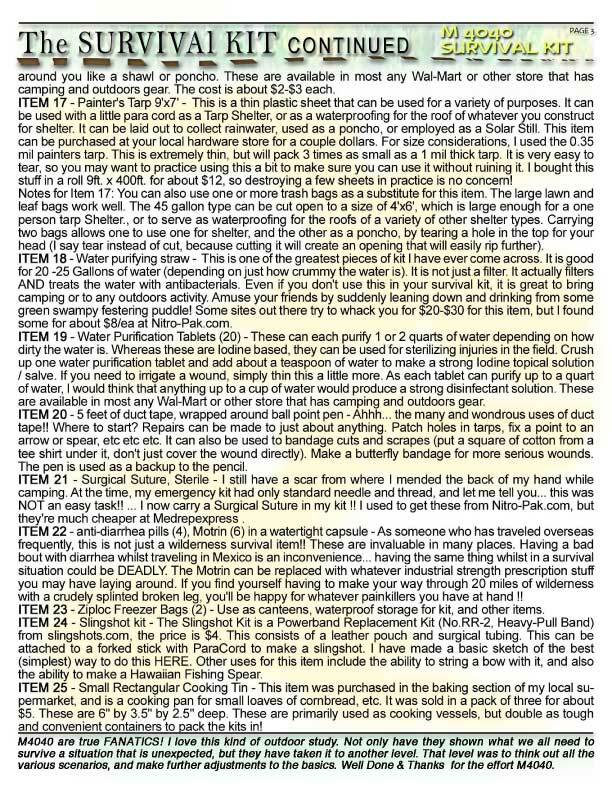 The items in his Survival Kit are store bought individually, or put together by what he had in his own home. It is OUTSTANDING! 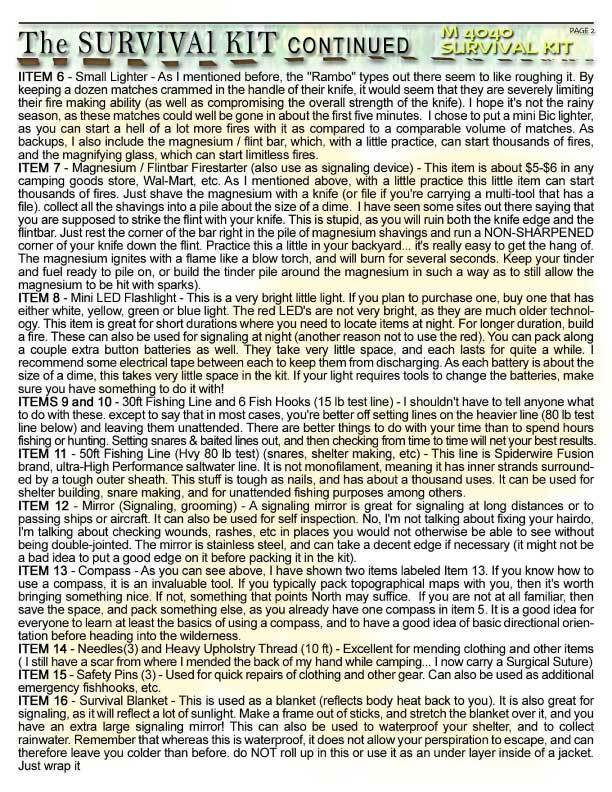 Download the M4040 Survival Kit here. Just as an extra thought here. 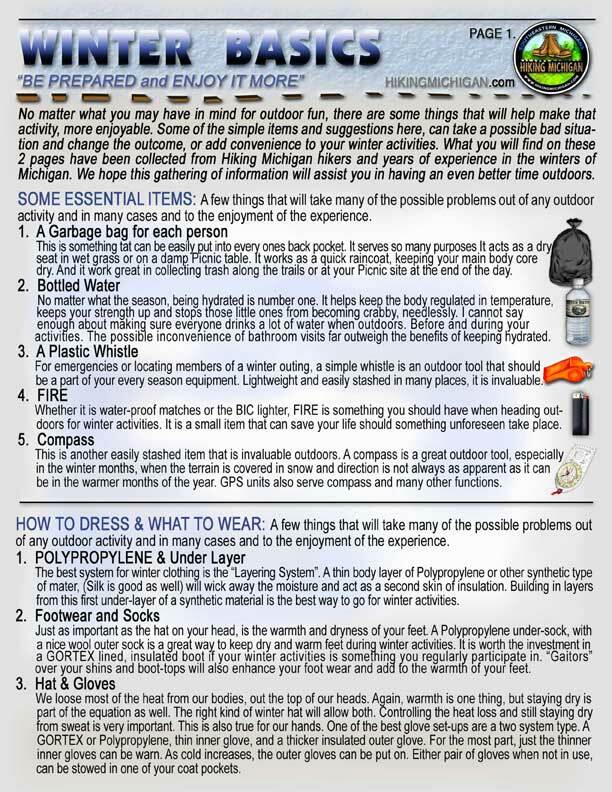 There should be things we all should have packed in our Cars at all times, through every season, whether we are heading out to the Trails at that moment or not. 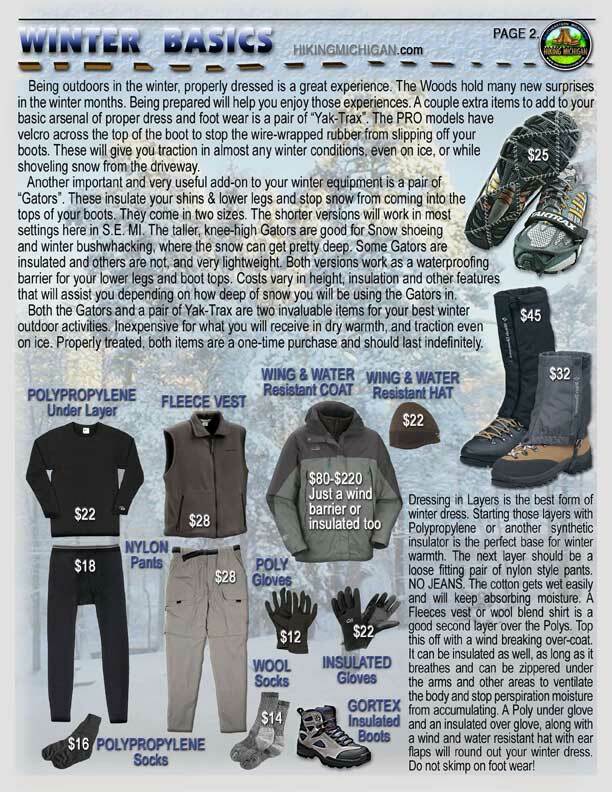 These items make a great base for safety, and have many, many uses for Survival as well. Download the CAR OUTDOOR KIT here. It is amazing how many things we all use for outdoor survival, works for outdoor safety and self defense. 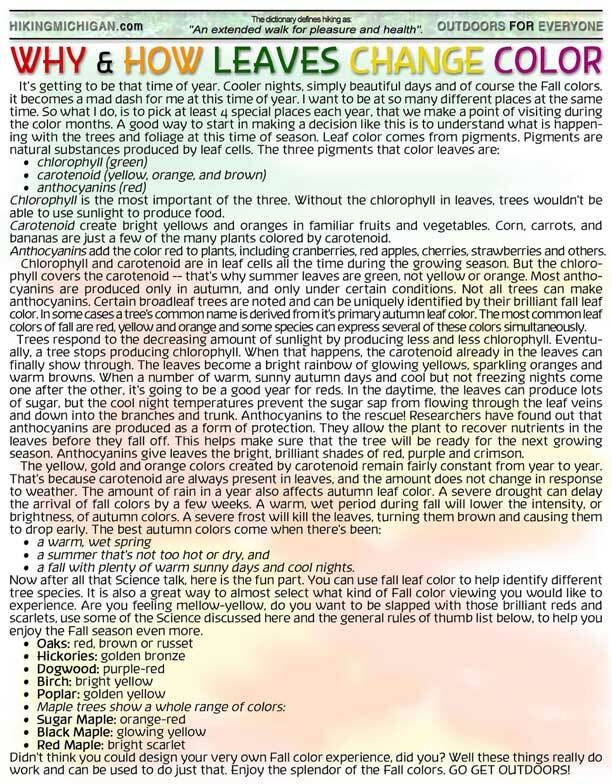 I hope this article and Download sheets helps out everyone in feeling safe and calm while outdoors. Because isn’t one of the reasons we head outdoors is to feel good about things and calm about the world? This has been a very interesting experience for me. After many, many years of leading Hikes and IDing birds, Volunteering for Bird Habitat re-newels, and generally enjoying spotting and watching for Birds out in the Field, I finally decided to start up Bird Feeders and Bird Habitats in my own yard. When I first started a couple of months ago, I had absolutely NO results. Not a single bird showed up to sample any of the delectable treats I was leaving for them. 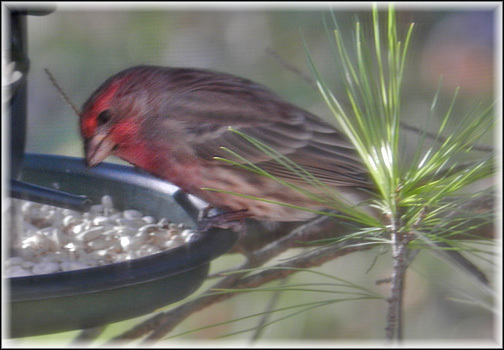 I checked with local neighbors, who have been feeding the Birds for years in my area, and they told me that this was the slowest year for Birds coming to their Feeders, that they had ever experienced. So I made a Post to all you HM people about this problem and concern I was having with the total lack of response to my Feeders and Bird habitat I was creating in my yard. 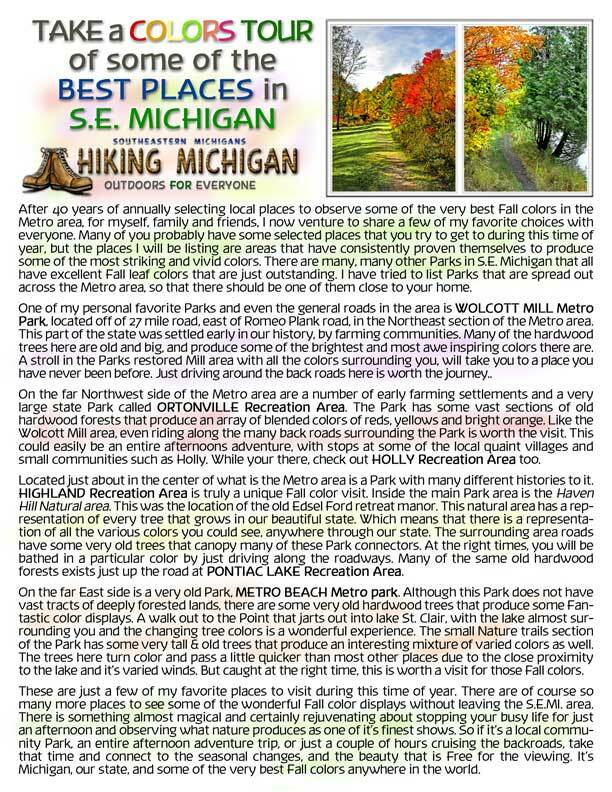 I received so many responses from you HM Hikers, it took me almost a week to sort through all the great advice.But it was sure worth it, and I now Thank all of you for your wonderful suggestions and directions in what to do. 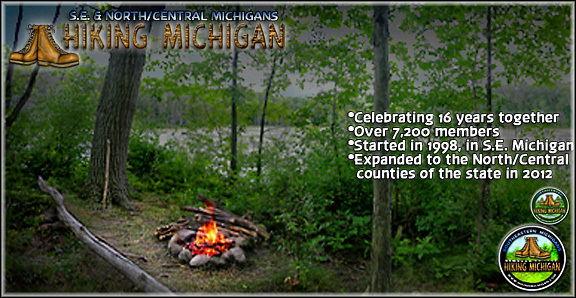 I now have one of the most extensive Bird Sanctuaries in S.E.Michigan. 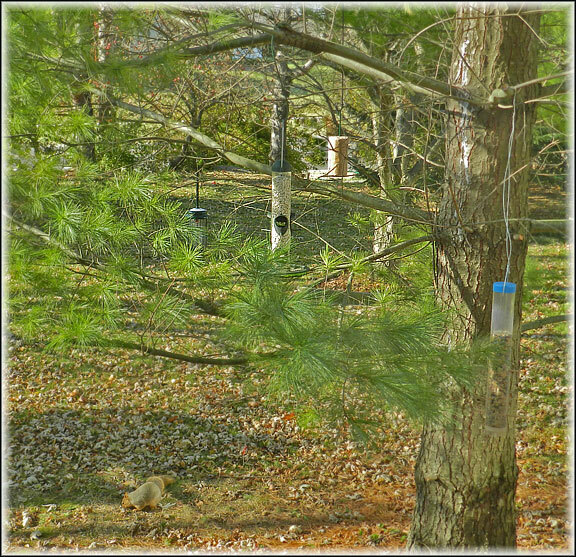 🙂 🙂 I have now erected over 8 different types of Feeders, from open Tray style, to Nut-filled tubes. I have Suet blocks and special Saffron seed feeders. I also have installed a Water-Bath at ground level, which has turned out to be extremely popular with ALL visitors. Besides following the advice from all of you experienced and helpful HM members, I came across a Wonderful book that has been, and will continue to be my “GO TOO” book on Bird Feeders and Backyard Bird habitats. 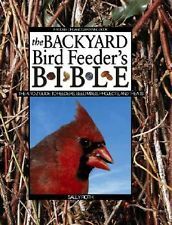 It’s called the “Backyard Bird Feeders BIBLE”, by Sally Hayes. What an unbelievable Book. It covers everything from store-bought food, to creating your own mixes. I have followed much of the advice in this Book, and have come to find that the best advice I received from you HM people, where the advice most given in this Bird Bible. 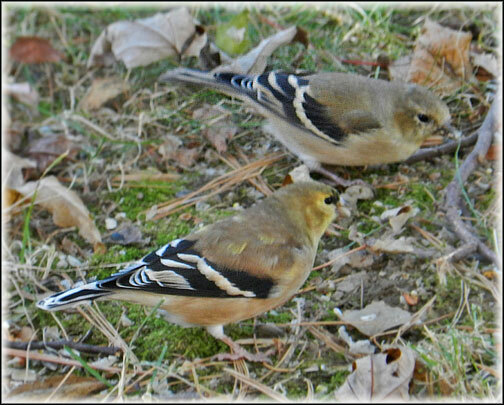 All this Food, Water and other Goodies has also attracted other critters. 5 very old, fat Fox Squirrels, and one very small youngster. A unique Red Squirrel (what a treat), and 3 Chipmunks. 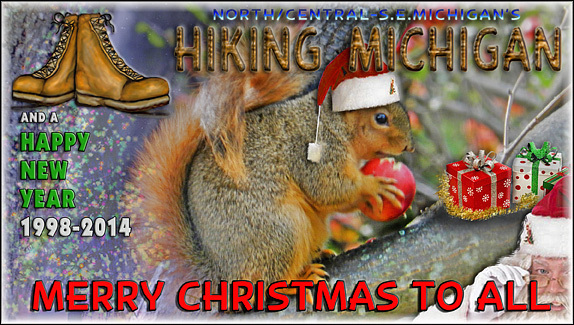 I enjoy the Chipmunks, Red squirrel and small Fox Squirrels. 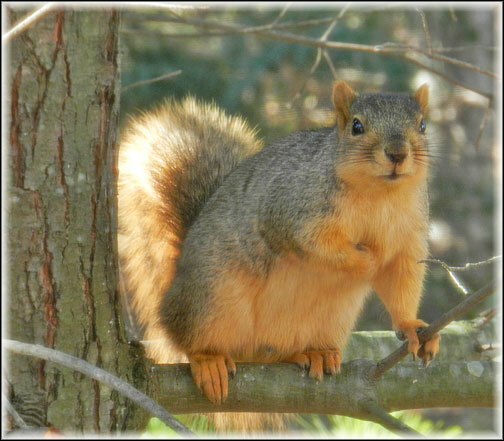 But those large adult Fox squirrels are just plain Bullies and gluttons. By using some Pepper sprayed on the trees and ground, and chasing some of these squirrels with my Witches broom, :-), I have managed to keep the peace amongst all the critters so far. a fix to deal with this guy. I do not wish to harm him, but he better behave or he will leave me with no alternative. Suggestions? So……with weeks worth of patience, all the great advice from all you helpful HM Bird people, and an example of just about every food known to Bird-dom, the Birds are arriving in droves on a daily basis. The proper habitat, Trees and Bushes, not to mention plenty of cover, has attracted almost every species in the area. Now the neighbors are wandering by and wondering why they see flocks of Birds circling the property. 🙂 Finches of all colors, Sparrows of every type, Jays, Cardinals, various Woodpeckers, Juncos, Red-breasted and white breasted Nuthatches, Chickadees, Titmice, and even Pine Siskins. This is just the tip of the Bird list so far. New species discover the Sanctuary almost every day. I am installing a couple of audio/video cameras to listen and watch the activity. Mostly to listen to all the sounds. And believe me there are many sounds. Next Spring I will be constructing a small Pond and waterfall, complete with Frogs, Turtles and even better habitat for even more Bird species. Once again, I would like to say Thank You for all the suggestions and advice you HM Birders gave me in helping to put together the start of what will be an ever-growing Bird Feeding Sanctuary, here in Rochester.